Check out the Community Resilience Building Workshop Guide. “Community Resilience Building” is a tried and tested approach that is now trusted by over forty five communities. You can get the Guide and much more at www.CommunityResilienceBuilding.com. The Community Resilience Building Workshop is a flexible “anywhere at any scale” comprehensive approach that gets municipalities, organizations, and agencies moving further on resilience. There was TwinCATS TAC & Policy Meeting with a special topic on the Climate Change Final Report presented by Michigan State University. This event took place on August 19th, 2013 in Benton Harbor. Click here to view the PowerPoint presentation presented by Michigan State University Extensions. Click the link below to view the Final report! The public attended a Community Conversation on Climate; our second meeting was about how the region can be more resilient in the face of climate variability. This event was held on Wednesday, May 8th 2013 from 6 pm-8 pm located at: Michigan Works! 499 West Main Street Benton Harbor, MI. The May 8th forum provided an opportunity to report back on climate vulnerabilities identified by participants from our first meeting on February 27th, 2013. The Great Lakes Integrated Science and Assessment Center (GLISA) went over past and current climate trends specific to our region. There was also a discussion about potential climate impacts that may affect long range transportation planning, and how limited transportation funds can best be spent to address issues of safety, state of good repair and environmental sustainability on our roads, bridges, trails, and waterways. The meeting allowed the public an opportunity to determine which climate issues should be of the highest priority, and which strategies for addressing these issues will be the best fit for our region’s economy and environment. Michigan State University Extension, University of Michigan Great Lakes Integrated Science and Assessment Center (GLISA), Two Rivers Coalition and the Southwest Michigan Planning Commission hosted this event. Click here to view the TwinCATS MPO presentation from May 8th, 2013. Click here to view the Flyer from the May 8th, 2013 Event. Click here to view the Press Release from the Feb 27th event! Click here to view the flyer from the Feb 27th event! Executive order that President Obama declared on November 1st 2013. He is calling for more resiliency planning to combat the effects of climate change. Material on climate change, its likely impacts, and opportunities for mitigation and adaptation. The Earth's climate is dependent on both human and natural factors, making climate change a complex issue. This Fact Sheet addresses some of the most common questions about climate change. Learn about the complex system of weather and the climate. This bulletin is from the Climate Change and Agriculture Fact Sheet Series. Greenhouse gases occur naturally and allow us to survive on Earth by warming air near Earth’s surface. Human activities are now increasing the amount of greenhouse gases in the atmosphere, which leads to changes in climate. These changes are affecting many human activities, including agriculture. This bulletin provides an introduction to greenhouse gases and how they affect our planet. This bulletin provides an overview of how greenhouse gases are related to agriculture and how climate change is likely to affect field crop production. It includes mitigation and sequestration strategies for field crop growers. 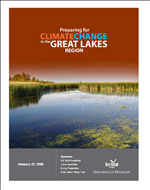 Want to learn more about climate change in the Great Lakes region? Michigan Sea Grant has compiled this list of useful reports, presentations and educational resources to help you get started.